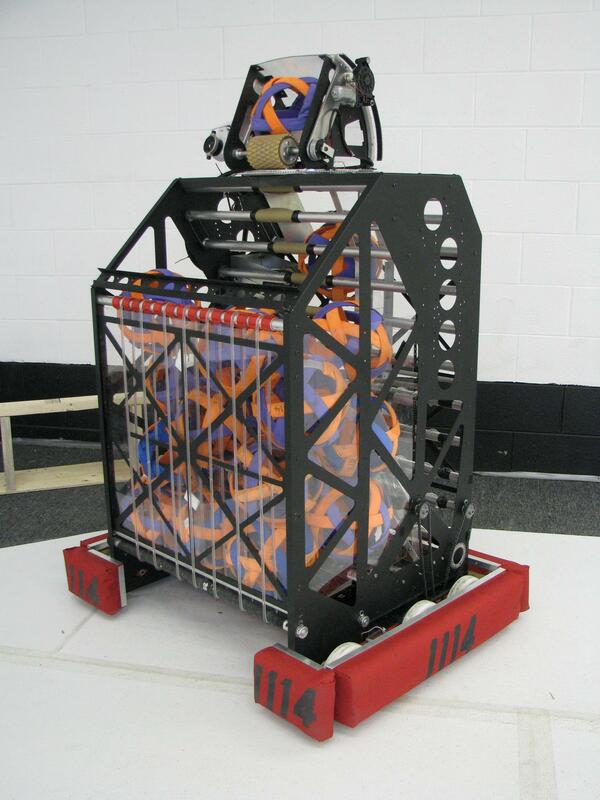 Team 1114, Simbotics, presents our 2009 FRC robot, Simbot Panthro. Did 148 help out with the sheet metal work? On Vimeo you can actually read who the video is thanking. I still say it would look better in silver. My goodness, I knew there was a reason to stay up past midnight besides work. I especially loved the moment at 1:34, why do I have the feeling I will see that move executed time in, time out, over and over, and why do I also have the feeling that it’s already been done time in, time out. Haha! Looks amazing as always Karthik, Can’t wait to see it in action in person. The bumper mount looks illegal. It’s official. I’ll see you guys next Saturday… I just got my bus tickets. p.s. Did I notice some auto camera tracking going on in the video? Is that an extra lens on the camera? Everything looks amazing! This is the first turreting shooter that seems to consistently make shots. Great job! Finally!!! a video of a shooter that works! That thing looks devastating, well done. Mind telling us what type of lens that is on the camera? Im guessing its a wide angle. Karthik, major props man. This is exactly what I wanted to build this season, except we didn’t get the camera to track (still need to get it working) as well as you guys did. Loving the amount of chain and the hidden chain runs. Did you guys find a way of tensioning the very small runs. BTW, the floating sprocket seemed to work very well. Can’t wait to play against you guys this year. I’m fairly certain this is what half of FIRST *thought *they were building this season. I guess we’ll see how many others can live up to this one. To see this robot in action is mind-blowing. Another elegant Simbot design proves to everyone how it should be done. I’m loving the fact that this thing will be in the hands of one of FIRST’s best drivers. Game on. You can always tell the really quality robots, because they’re the ones that makes you depressed. I love you guys. Good luck in Chicago. I knew it! Pause the Robowranglers video (http://www.youtube.com/watch?v=aCVLZFyEI1Y) at 0:39, and you can see a picture of the Simbotics bot hanging on the whiteboard! Huzzah! 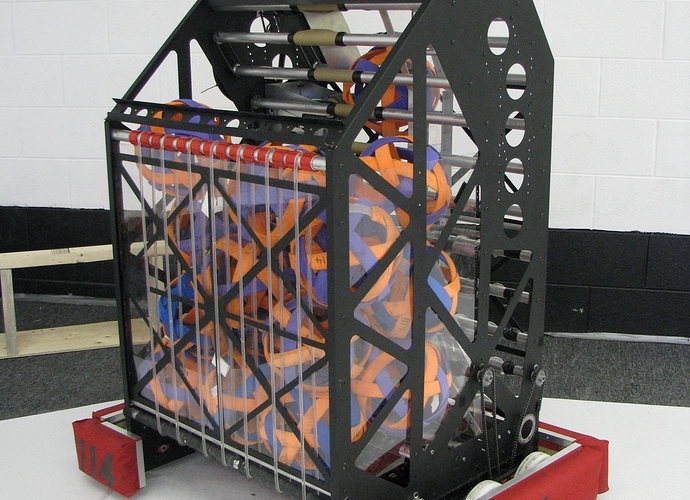 Fantastic robot, a wonderful demonstration (yet again) of the optimum FIRST robot for the given game. The video also demonstrated why I think turreted shooters will do well this year… note how they can pin a robot and score into it’s trailer. Actually, they just need to be near another robot to score in it’s trailer, but you get the idea. What’s powering the shooter? That’s an insane fire rate! Wow! That is super impressive! If it’s camera code, it’s dang sweet, and if it’s an operator he/she really knows what’s up! I can see 1114 have a clear radius of about 2 robot lengths at all times when they’re on the field, you get to close and you’ll have a trailer full! Iz it can be 1114 win tiem nao plz? Another bamf robot name btw. Great job Karthik and all. Did 2056 also turn out a beast like this? Yes, all turreted shooters will be just as good as 1114.